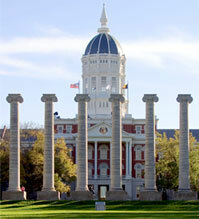 WHAT: This year marks the 175th anniversary of the University of Missouri’s founding on Feb. 11, 1839. The university community will begin its celebration by hosting an official kickoff party with a brief program, giveaways and birthday cake. The event is free and open to the public. NOTE: The event will be live streamed at http://goo.gl/Rv7k4g. Use #MIZZOU175 to join the birthday conversation on Twitter. For more 175th anniversary information, visit http://news.missouri.edu/category/175th/ .